Enjoy the last day of Carnival season with these celebrations from around Europe! It’s the last day of the season for carnivalistic joys and games, and Europe has a rich tradition for carnivals and merriment. We hope you have fun with these short clips from across the continent. Feel free to search for more spectacular celebrations on EUscreen.eu! It’s carnival season, and some carnivals are more mobile than others. During the Vierves-sur-Viroin carnival, a Giant is built and then sentenced to be burnt to the delight of the local population. A swirl of confetti and parades floats from Taormina to Viareggio. Carnival masks and preparation for the Carnival in Cerknica along with traditional carnival masks from Vrbice. A masked performance during carnival. Artist carnival in the Odd-Fellow mansion in Copenhagen. Performance by one of the “chirigota” groups that sing satirical songs about topics in the news during carnival festivities. In this case, the group sings about the war in Iraq. A look at the different ways of celebrating Carnival in Catalonia, such as the dance of the crazy giants in Solsona, the candy war in Vilanova i la Geltrú and the parade in Barcelona. 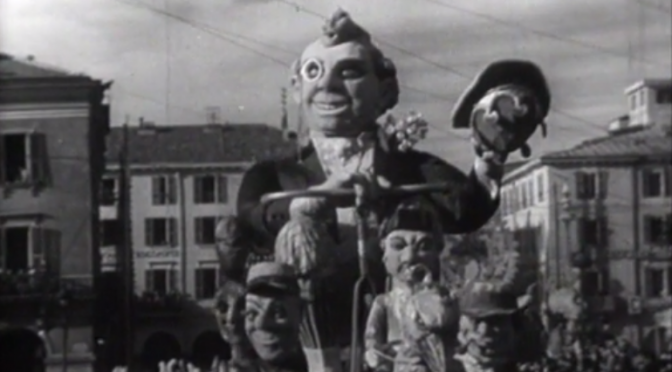 A report on the carnival in Sörg in Carinthia. Picture shows one of the Carnival parades taking part in London’s Notting Hill Carnival which is held every August Bank holiday. It first began in 1964 and has become one of the biggest street festivals in the world. The carnival floats by amidst the cheering crowds at place Masséna in Nice. This continuing series on clichés about Germans deals this time with Germany’s so-called 5th season, carnival. Michael Wigge asks his countrymen what their attitude towards the merry and crazy tradition is and shows us what kind of costumes people come up with. Photo source: Institut national de l'audiovisuel. All rights reserved.